The Rhode Island Children’s Chorus is a non-profit organization, founded in 2003 by Christine Noel, its Artistic Director and Joyce Wolfe, Executive Director. Based in Rhode Island, choral members include children from over 30 cities and towns in Rhode Island and Massachusetts. From its beginnings with 14 singers, the chorus has grown to over 200 current members comprising six choirs. The Chorus appeared in the film Moonrise Kingdom (2012) and on Bill Harley's album "I Wanna Play," nominated for a 2007 Grammy Award. The Chorus has collaborated with the RI Philharmonic and other professional ensembles. The Chamber Chorus performed at the 2009 Music Educators' National Conference (MENC), and at the 2010, 2012, and 2014 conventions of the Choral Directors' Association (ACDA). The Chorus has enjoyed performances at the RI Convention Center, Blithewold Mansion in Bristol, Marble House in Newport, Sakonnet Vineyard, the RISD Museum, and Linden Place in Bristol. The Chorus performs for local events, including Waterfire, the March of Dimes, the Izzy Foundation, the RI Foundation and the annual ball for Hasbro Children's Hospital. RICC opened for the Radio City Music Hall Christmas Spectacular Starring the Rockettes and has performed the National Anthem for the Harlem Globetrotters and the Providence Bruins. The RICC Training, Lyric, and Chamber Choruses recently filmed three commercial spots for Benny's. The mission of the chorus is to provide children with musical instruction, vocal training, and performance opportunities at the highest level. Through the RI Children's Chorus, singers develop musical ability, vocal skills and performance readiness in a friendly, non-competitive atmosphere. Natural talent emerges and confidence grows as the singer masters a repertoire that includes classical, contemporary, multicultural, and patriotic choral music. Strong bonds of friendship become a part of the choral experience as they participate in this rewarding artistic activity. 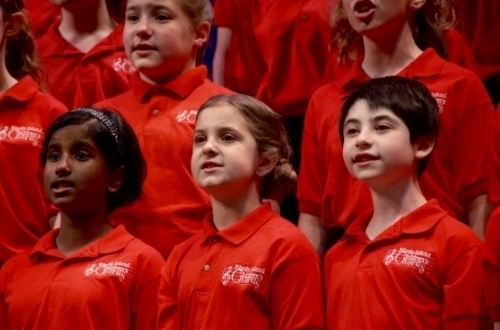 The Rhode Island Children’s Chorus is comprised of six choirs in four choir levels. Singers are placed in the appropriate ensemble at the discretion of the Artistic Director, based on age, musical development, and maturity. Members of the Training Chorus learn basic music and vocal skills. Healthy vocal production, tone quality, ensemble singing skills and performance etiquette are developed in an encouraging atmosphere with age-appropriate music. The Training Choir performs a minimum of two concerts per year. The Lyric Chorus is a beginner-intermediate ensemble that focuses on continued development of vocal technique, musical skills, and performance etiquette. The repertoire includes music in two-part harmony in English and other languages. The Lyric Chorus performs a minimum of two concerts per year. The High School Honor Choir is an advanced level ensemble for young men and women, offering continued focus on vocal and musical development. Our rehearsals are inspiring and productive, and the students are very welcoming. The Honor Choir hosts two major concerts per year and performs at many high profile events (see above). The Chamber Chorus offers advanced training in vocal technique and musicianship for sopranos and altos. The repertoire includes challenging works (in three- and four-part harmony) in multiple languages from different periods in music history. This advanced women's chorus serves as the touring choir for special events and invitational concerts. ~ Rehearsals are on Sundays from 2:00-4:00pm in Smithfield. Chamber Chorus members also attend Honor Choir rehearsals on Tuesday evenings in East Providence.